Our 2000 Elantra wagon has 94,000 miles on the clock. We had a nagging clunking noise for years on the rear passenger side. It started way back when the car was under the 36,000 miles bmper-to-bumper warranty. Back then I used to take the car to the dealer even for regular maintenance (every 3,000 miles or less - oil change, inspection, tire rotation, etc). They never saw fit to "find" the problem, due to either incompetency or purposeful economical indolence. I cannot find another plausible explanation for why they were never able to diagnose the problem, even subsequently. To make story short, I gained since December last year quite a bit of mechanical hands-on experience, coinciding with purchasing an used Audi A6, which I had to overhaul (head gaskets, intake/exhaust gaskets, Valley Pan gasket, Timing Belt, Water Pump, Camshaft seals and plugs, T-stat, gaskets all-around, CV axles, front wheel hubs and bearings, O2 sensors, spark plugs, plug wires, ignition switch, CTS + Temp Sender, etc, etc) by myself. 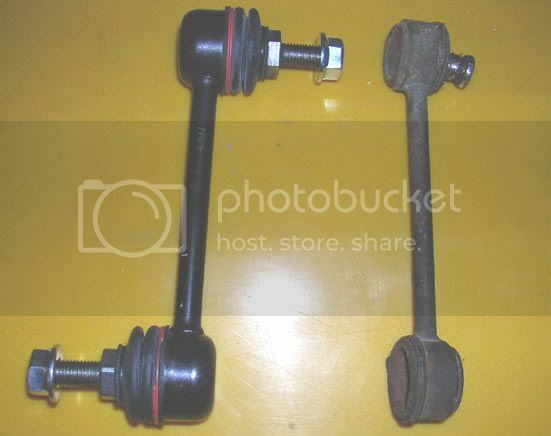 A month back, I changed almost the entire exhaust system (minus the muffler) on the Elantra. While under the car, I thought is a good opportunity to investigate what the source of the noise was. 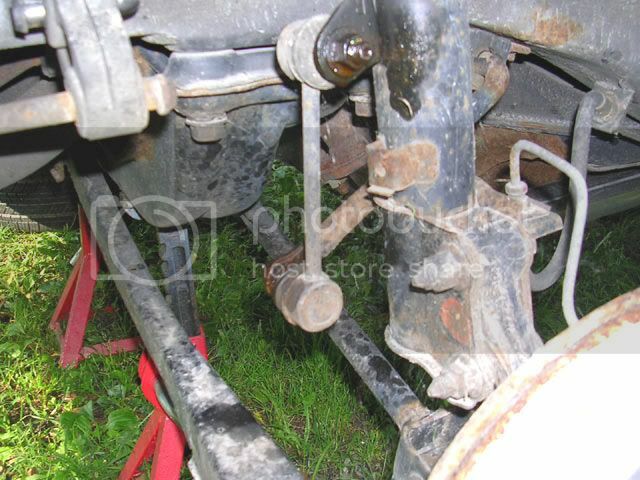 Least to say that I noticed right away the looseness of the sway bar link. As I wiggled it up and down, I was able to reproduce the clunking, metallic sound we heard for years. Nedless to say, I decided to order parts and replace both links, remaining to do the front at a later date. 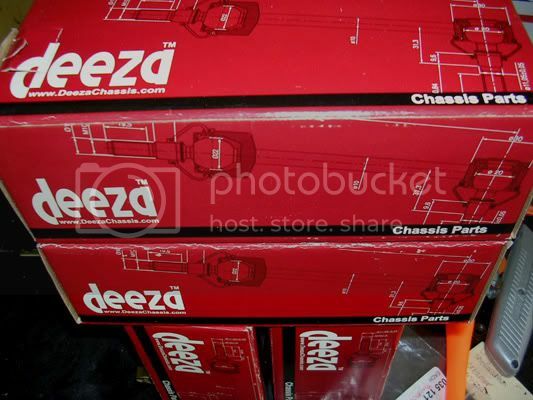 I purchased DEEZA parts - trademark of Disa Automotive Ltd. If the nuts can be removed easily, I would give this job a difficulty rating of 3 on a 10 scale. The most difficult part is to ... jack the car up. PBlaster is a trusty helper for this job....or any loosening and penetrating oil for that matter. 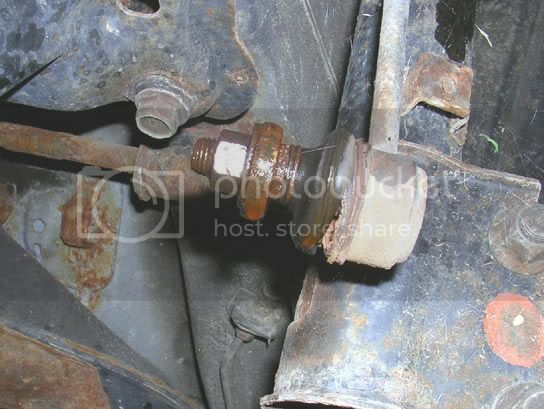 Soak the nut/threads very well over night, and prior to starting the job. 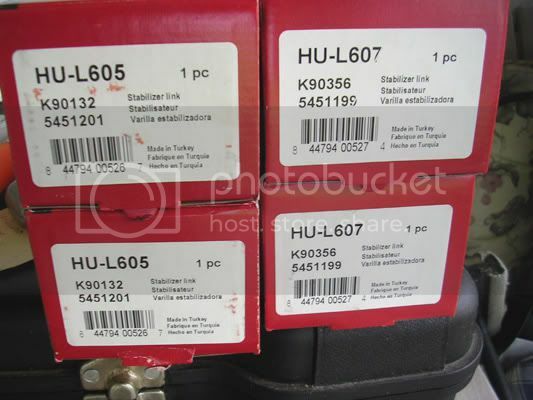 The nuts securing the links on my Elantra were 14 metric. You need to find a way to hold counter on the other side of the mounting hole. The OE links had a pretty crappy counter system (extremely thin) and due to weathering/rusting they stripped shortly after using a regular crescent wrench. 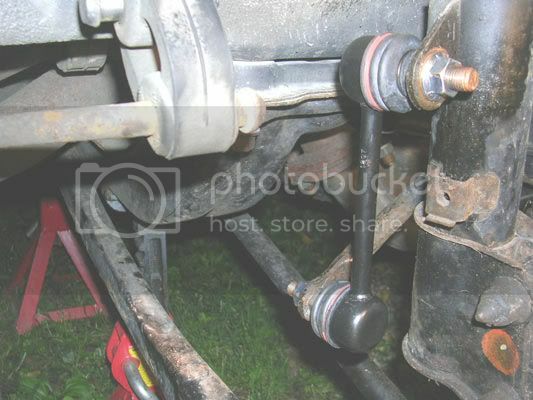 I had to use a pair of small locking pliers to get a good hold of the countering pseudo-nut. 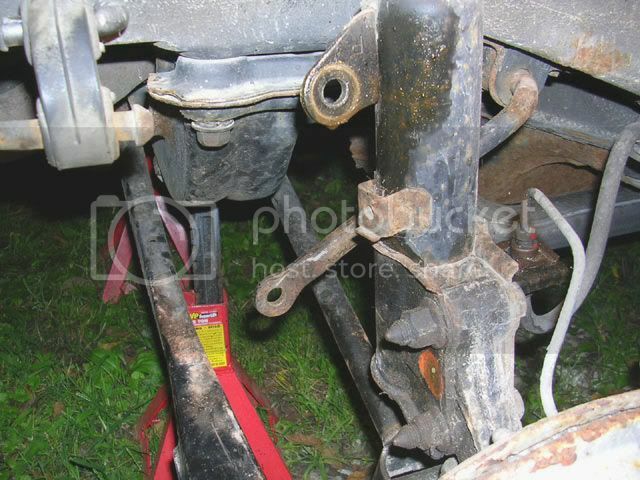 Fortunatelly, I was able to get all the nuts loose on both sides without much trouble. I started them with a breaker bar, then continued with a ratchet wrench. The nut on the new ones was 15 metric, and the countering nut 16 M. I got some anti-seize paste on the threads and I mounted them without a problem. As I said, it is a pretty easy job. 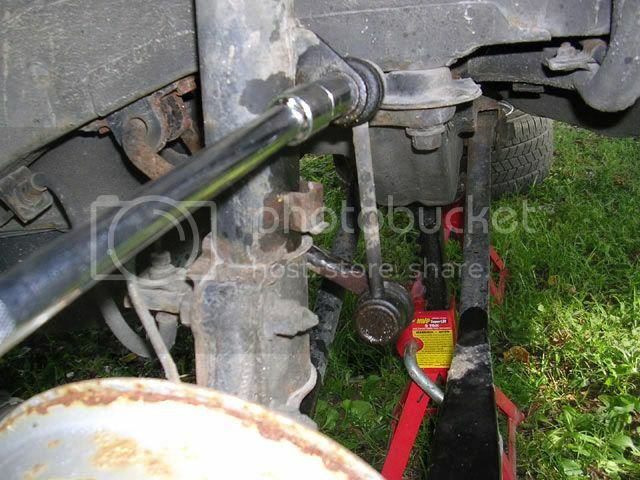 However, if you don't know how to jack the car up, you should not be performing this replacement/repair. Rather take the car to an indie shop...or at the dealer if you like them much. 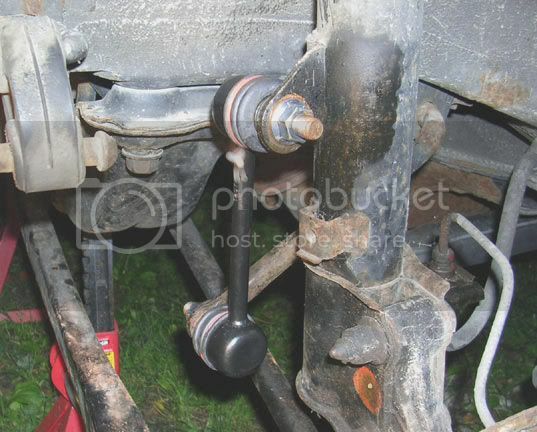 Good luck, as this gives a general idea of how bad sway bar links can be replaced. I shall not be held responsible for any mishaps such as the car falling on you if you don't know how to properly and securely raise the car.